“I became aware of [Robinson’s] extensive knowledge when I took her Human Resources class this past fall,” said Abigail Hickman ’18, at the Mortar Board reception last week. “Her rich background in education and business management helps her conduct a class with ease. I think I can speak for everyone in her HR class when I say it was one of the most enjoyable classes I have taken at the University of Redlands. “She implemented a lot of structure within the class that made us prepared each day for what was to come. The stories Professor Robinson used to tell about her daily life in HR helped make this class very engaging. Her personality and humor kept us interested in the subject matter and encouraged us to study the material. Robinson (B.S. in psychology, Texas A&M University; MBA, California State University; M.A., Ph.D. in organizational behavior, Claremont Graduate University) has been teaching at the University of Redlands for almost 22 years. Her research interests include leadership, gender issues in management, and work-family conflict. 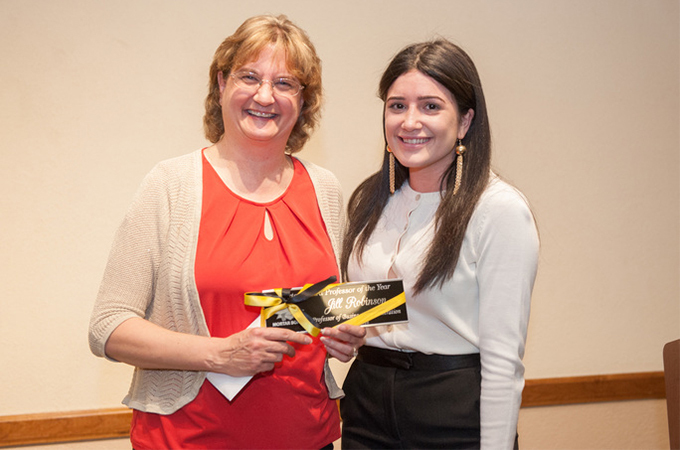 This was the 60th year that Mortar Board undergraduates honored a distinguished faculty member who embodies the group’s ideas of scholarship, leadership, and service. Mortar Board began at the University of Redlands in 1943 as a women’s senior honorary group, known as W.E.B.S., Wisdom, Excellence, Belief, and Service. In 1955, it became officially recognized as a chapter of the Mortar Board National Senior Honor Society. In 1975, membership was opened to both men and women. This year’s Mortar Board finalists for Professor of the Year also included Political Science Professor Art Svenson, Philosophy Professor Lawry Finsen, and Chemistry Professor Rebecca Lyons.